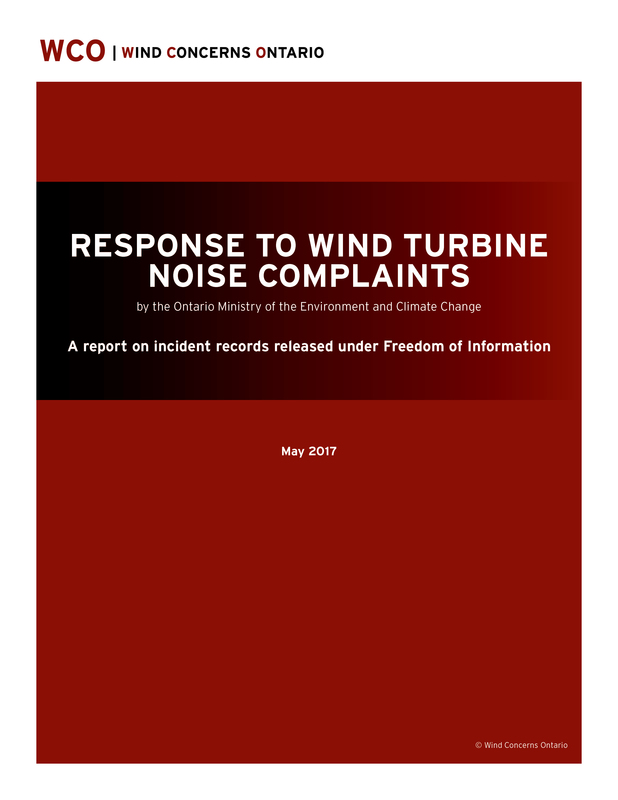 This past spring, Wind Concerns Ontario conducted an analysis of Ministry of the Environment and Climate Change (MOECC) response to reports of excessive noise and vibration(MOECC) and concluded the process for responding to citizen complaints is deeply flawed and largely ineffective. Global News ran a two-part investigative report on this information, which featured Ontario families who have been complaining about turbine noise for years, with no resolution. More documents recently released under Freedom of Information (FOI) and correspondence with Ministry staff reveal problems with the Cornwall office that are further examples of a poor strategy for response. The documents and email also are a clear indication that the MOECC has completely abdicated its role as a regulator, and leaves resolution of any problems up to corporate wind power developers. The Cornwall office up to now has only had to deal with any reports of excessive noise stemming from the 30-megawatt South Branch power project in and around Brinston, Ontario. Documents show that noise complaints were made even before the project began commercial operation in March, 2014. No report number means no records? Our initial request for information resulted in three records, which did not match Wind Concerns Ontario members’ experiences with this power project. It turned out, the Cornwall office had not been giving Incident Report numbers to people reporting, as is procedure, so their complaints were not recorded or tracked. On the advice of insider, we re-filed a request, this time asking for “investigative” reports and a handful — again, at odds with our members’ real-life experiences–was turned over. Do you have any acoustic results for that specific turbine yet? 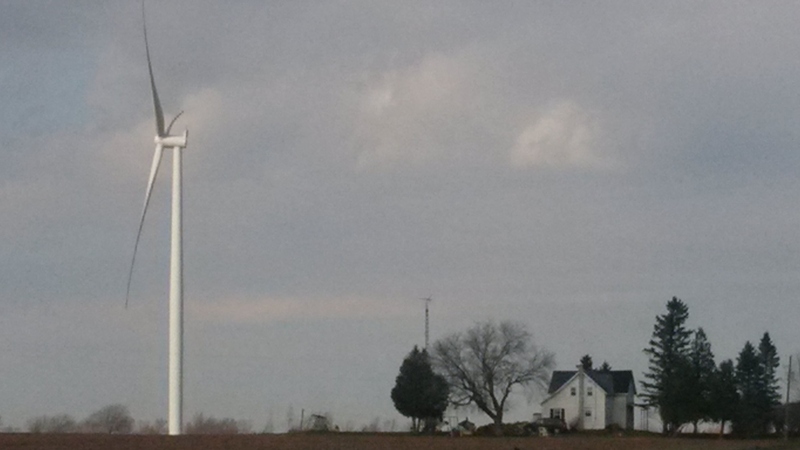 March 20, 2014: I have had several sleepless nights when the wind is in the east direction as the sound waves of the turbines kept me awake from 12:30 a.m. or 2:30 a.m. until morning. [Redacted] Is there any way we can control the wind turbine motion for daytime hours only as [sic] they do not run from 10:00 p.m. until 6:00 a.m.? June, 2014 IR 5006-9KYK5D: ..caller report last night was the 7th night since start-up of wind turbines as SBWF that she has been unable to sleep for the noise …Noise is described as drone of an airplane — very loud with windows closed. This summer, a Brinston area resident wrote to Minister Murray about the complete lack of response to her reports of excessive noise (she has had to sleep in her basement on occasion because of the noise and vibration), and an officer with the Cornwall Office telephoned her. Here’s what she was told. *Ministry staff were completely unprepared for wind turbine noise complaints. *They still don’t really know what to do. *They “lost” her records — even though she had so many reports that the MOECC actually installed equipment and did noise measurement for several days. “Lost” records? Citizen complaints under the regulations “don’t matter”? And she was “the only one”, which is completely false? “Ah…I haven’t had a chance to review this new protocol in its entirety…there are some changes worth noting. Thank you for bringing my attention to this. I will be requiring the SBWF to post their reports on their website. I’ll keep you apprised. “This is completely inappropriate behaviour for a regulator,” WCO president Jane Wilson wrote to Minister Ballard. “The people of this particular area are now facing approval of a 100-megawatt power project by the same developer, this one close to TWO communities,* and they have no assurance whatsoever that the Cornwall District Office is prepared, or even competent, to respond effectively to noise complaints. As of September 4, 2017, the mandated compliance report is still not on the South Branch Wind Farm website. We have just been informed by the MOECC that the EDP documents have been reviewed and found to be incomplete and cannot be posted at this time. This project has been in operation for three years. Just the tip of the iceberg … we continue to investigate. Many thanks to all who donate and support us, as we continue this work. Thanks for this update on communication with Minister Ballard. We have so much saved evidence of incompetence and bungling within the MOECC. There’s lots of evidence of MOECC agents ‘passing the buck’ and delaying requests for information for months. Right now we have a request that was made in July…still no response! This is why people gave up on calling the SPILL Hotline and reporting complaints, both to the wind company and to the MOECC. It is such a struggle to endure the harm and persist with the effort of reporting, when no protection comes from this process. Being told to honour this MOECC protocol and procedure has become an insult. There is so much wrong with what is going on, it is hard to describe. But if no one reports to the Spills Action Centre, you are 100% guaranteed nothing will change. Keep reporting, keep recording, inform your MPP. Our MPP, Lisa Thompson, has presented this issue at Queen’s Park…most recently, in late May, on the last day of the last session before break. She was excellent! Nothing was done about the fact that the MOECC had finally recorded audible noise. Minister Glen Murray quit shortly after that. The noise continued throughout the summer and continues to this day. People have reported to the SPILL HOTLINE and to the MOECC officer. throughout the summer….the noise continues. Apologies to the chatham kent protesters… glad to hear you were not carted off by police… i reported that from an unreliable source (which i will not be using again) and was very angry at that news and did not confirm my findings. Again sorry for the misinformation and i wish you all well and best of luck protecting your precious wayer resources… sorry WCO and any one else for my mistake…. Have you been down there to visit? You seem to have a lot of enthusiasm. Can you please help this group? Also, can you tell us who the source is? They have reported other problems as well. In partiuclar, the visitor to the site that flew a Canadian flag upside down. They were asked to leave the protest site. However pictures taken evoked a strong negative response from social media. Finally, a request to WCO: Can we have a blog entry dedicated to this protest? We are commenting all over the place and need one place to discuss WWF. Thanks. Comparison of pre and post GEA commission of project development times. Hey there Richard…. ya that whole episode was a little embarrasing …. im usually very thorough in my investigation… i did actually visit the one site north of Chatham…. after reading the Dover township wells going bad in our local paper The Chronicle …. there was a full page article. I decided to visit the site listed on the Water Wells First website stating they were protesting at a turdbine site… i got lucky the first of the three listed protest site was the one… i brought those folks something to eat… there was a Walpole Island police cruiser sitting there wth an officer inside.. i was advised not to go past the cruiser or i would be charged …. i talked to the folks there and got 1L. Of water from a man … black as the ace of spades… i was so upset to see this….. i thanked the folks and wished them luck… it was a long drive home with that bottle… i contacted our local councillor after i got home… he was on his way to our council meeting… i gave him the bottle and pleaded that he make this a point of discussion…. he did… ended up on the front page of THE Chronicle … lotta folks really concerned… inverenergy lawyer and local rep was there at the meeting… (i hope their hearts sank when they saw it) … now we will be officially putting this sludge water on the agenda for the next meeting …. i believe that the green energy act will not come between my communities water…. the clean water act of 2006 is an act that citizens like myself can use to protect our water resources….. it says it… it’s law…. its my right and duty as a citizen of Ontario to protect any and all water resources… lakes… rivers… creeks… streams… ponds… auquifers…. surface water… runoff water… ground water… sewage water… water from my pool… water is not a right…. its a previlidge… we will not allow our water to be contaminated… period…. I’ve read comments from the local Invenergy rep. stating that….. its going to be ok here because 95% of the municipality is on municipal water anyways…. So then its ok if 5% of the municipality lose their well water!!???? Again… something so wrong with that statement from invenergy rep.. Richard i hope this helped… keep on keeping on!!! Also Richard…. Ido not believe that the upside down Canadian flag holder was the same person who gave me misinformation…. that person would have to have personal knowledge of who I am …. where i live… and where I work…. If the Cornwall or any other office of this Liberal government or its entities sends someone to do audible testing I would like the administrator of WCO to be informed and she can contact me. I am a Federally Certified Electronic Technician with experience in feedback, reverb, phase distortion and many other genres of sound. When setting up sound events these effects, by law, must be checked and attenuated even on regular construction projects. But not the IWT projects. I do understand that any government employee attempting this will be provided with many credentials to bolster their claims. At least I could verify their testing system. In my dealings with government agencies I have never met a competent technical person on staff. Outside contractors are always called in and therefore the government entity cannot be held liable or responsible and the final report can be modified as needed before release to the public. (Or shelved). Machines vibrate, make noise and need constant maintenance. More tests of any kind, anywhere will not change this reality and of course this is not news and was considered before the IWT’S were contracted. All of this terrible hardship has been caused by Dalton McGuinty and Kathleen Wynne and their Liberal supporters.